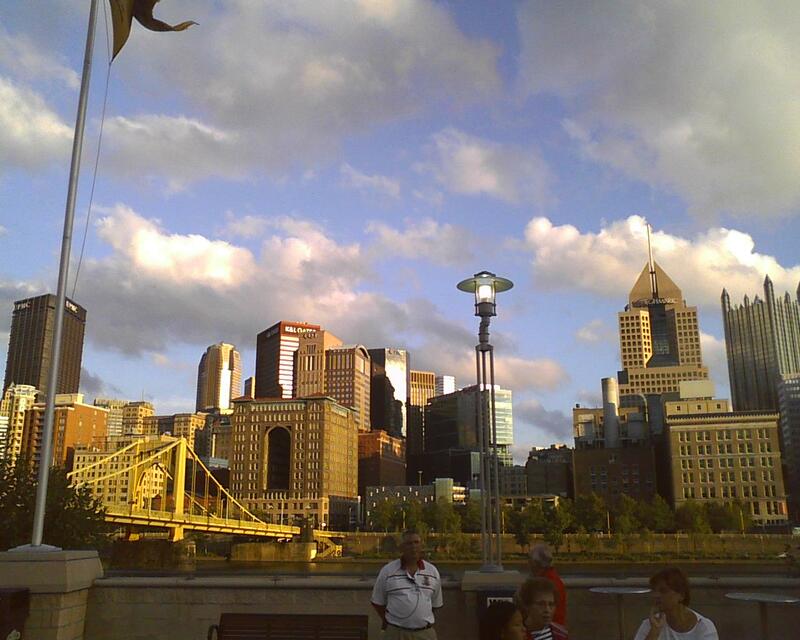 Today would end up being a great day for ballhawking, just about as great as this Pittsburgh skyline on a day where it was predicted to rain. As I entered the LF bleachers looking for any easter eggs, a home run was hit right at me by an unidentified Pirate for an easy catch of Ball#1. 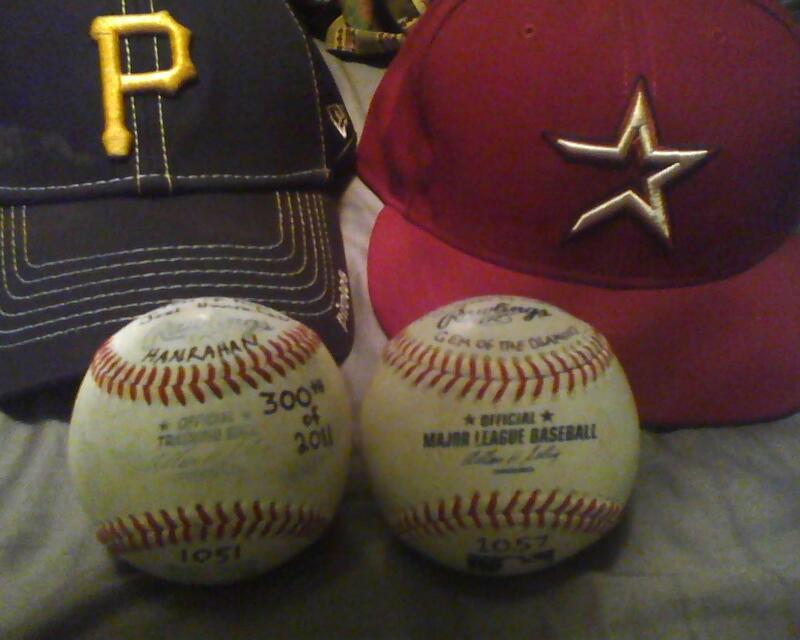 Another thing about today was that by obtaining three balls I would finally reach 300 on the year. Ball#2 was a scrum for a ball hit near this empty part of the bleachers which landed against the back of a bleacher and stayed put where I was able to pick it up with no trouble. If youve read my blog you would have noticed that the Pirates closers that shag balls in left field kinda despise us ballhawks, they ignore every requests and sometimes engage in glaring stares and negative conversations about us ballhawks due to seeing the balls that we obtain. Being loyal fans of a team that has struggled for so long my opinion is that there shouldnt be such a dislike for us and that a toss up here and there rather then the negative reputation they perceive is unwarranted. Ball #300 would end up coming from the ring leader of the anti Pirate bullpen pitchers, Joel Hanrahan. Joel consistently goes out of his way to snag close home runs and close ground rule doubles and has spread his feelings to all of the rest of the Pirate bullpen that they now throw absolutely nothing into the stands. How ironic it was to get number 300 from the ring leader himself Joel Hanrahan. Somehow he had a ball and was facing the stands where myself, Erik Jabs, Ian Weir, and Jim Saylor, all regular ballhawks at PNC pled their case for a ball from the most anti ballhawk Pittsburgh Pirate. My statement to Joel was, “I am not going to lie, I already have two balls,” as he questioned each of us on if we had any baseballs yet. I also mentioned, “I would like to get number 300 of the year from the best closer in the NL.” He asked me if I was going to stop after number 300, I gave the honest reply of No. He considered the other ballhawks requests, then turned and threw me a knuckleball for Ball#3 and #300 on the year. Thanks Joel. 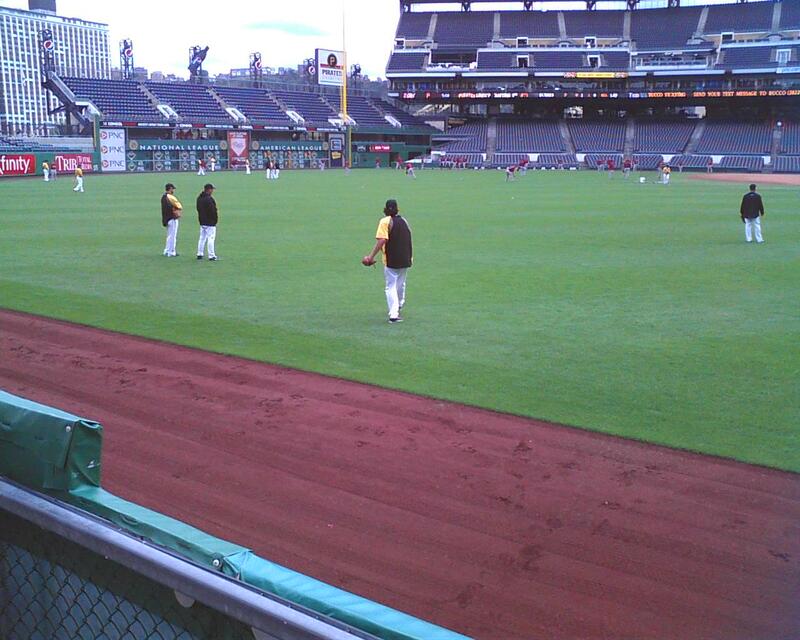 That was it for the Pirates portion of bp and I went to change into my Astros gear. Ball#4 ended being a toss up from Astros reliever Wesley Wright. Ball#5 was a nice catch of a Carlos Lee blast which went to the last row of the LF bleachers, I had a good read on it from the start and made a running catch from the vantage point of this picture into the last row ahead. I then made my way to the Roberto Clemente wall in RF as some lefty Astros were due to take their cuts. Things picked up pretty good in RF, more then I thought it would. Ball#6 was a caught home run leaning very carefully over the rail just as I was requesting a toss up, the ball was more then half way toward me, and I was lucky it was right at me, and I barely was able to make a can of corn catch due to my late tracking of the ball. Not long after this was a scrum for a home run that landed in the front row of RF which bounced high and over my head, I made an error on trying to catch it, but it dropped easily enough to pick up on the scrum for Ball#7. Ball#8 would be another scrum, it was hit pretty high up in the pic below, and most of the time due to the steep sections these balls bounce right back onto the field, this one didnt and I was able to srum it for Ball#8. That was it for batting practice, but the best was yet to come. In Andrew Mccutchen’s first at bat of the game, as I was standing in LF, he launched a serious opposite field bomb onto the Right center portion of the PNC riverwalk. 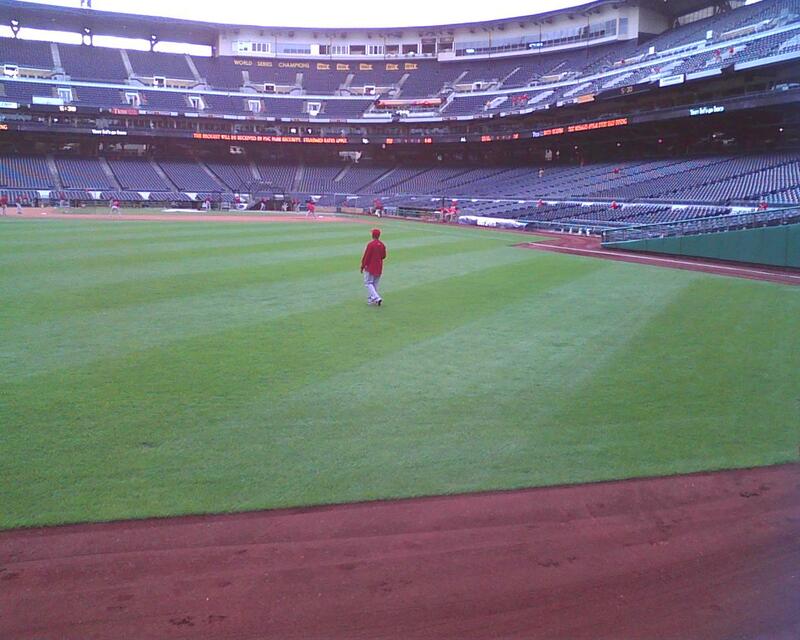 All I could think of was man I wish I was in my usual spot for lefty home runs there. Shortly after the home run I got a call from Erik Jabs in which he told me that from his seat in the club level he noticed the ball bounced out of the stadium. 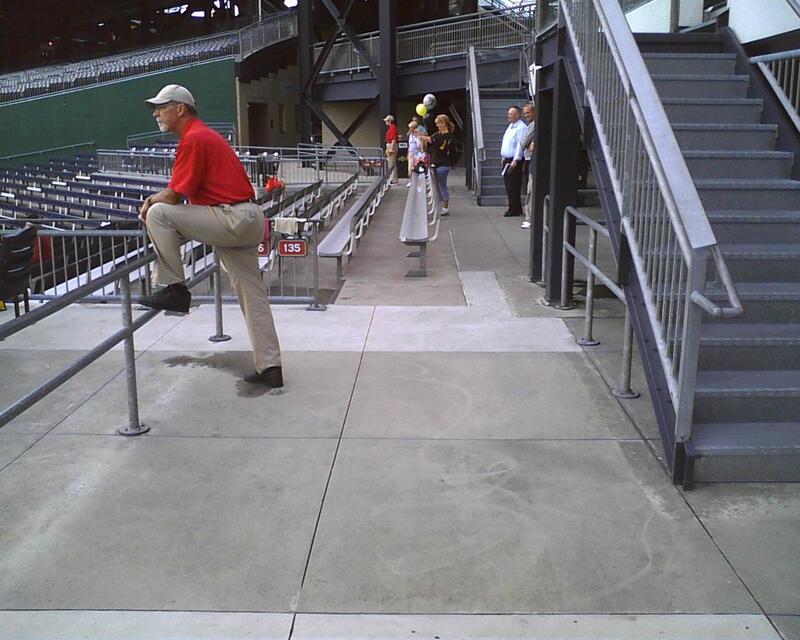 At this point I took off for a chance at finding the Mccutchen home run. When I ran out of the stadium toward the outside Riverwalk I noticed that Jim Saylor, a PNC regular ballhawk was already searching extensively with a cane in the overgrown weeds and grass. 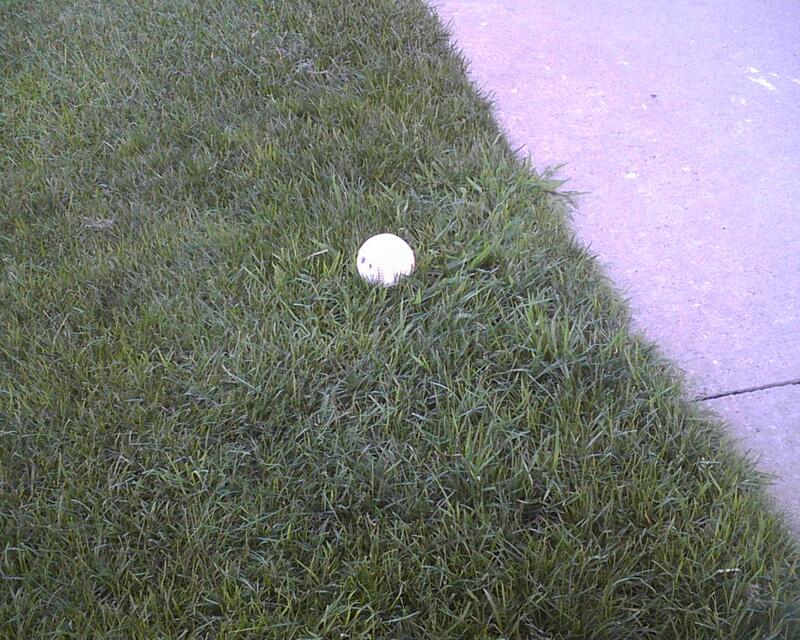 But as I approached I immediately noticed a game used ball sitting right in the grass below the trees. I picked it up to show Jim that I had the game time Mccutchen home run, and told him that he ran right past it. Here is where the ball was found. Now you may think, how did he run right past this ball in the grass? And I was thinking he may have tried to trick me by putting this one there to make whoever picked it up feel as though they found it, buying him more time to search the weeds and grass where he thought it was. 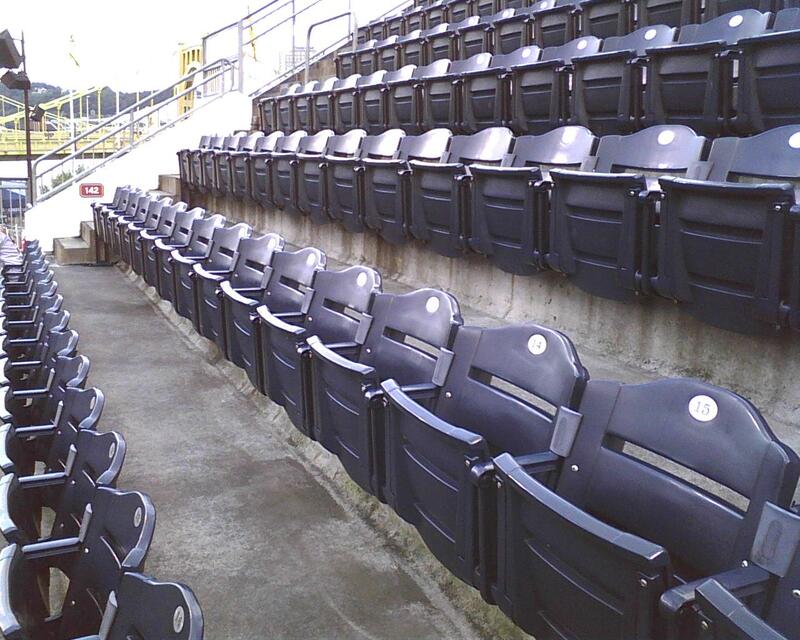 From his vantage point in his Right center seats there was no way he could have seen how the ball bounced out. After reviewing the replay it was obvious that the ball didnt take a straight bounce from where it landed into the weeds and grass, it took a major left near the tress and rolled down the grass, just missing the actual pavement of the outside riverwalk. I spent about 20 minutes after Jim went back into the stadium searching thoroughly through the weeds and grass where I had also assumed it may have gone, nothing was in there. When I saw the replay later it explained where I found it. Jims thoughts of it being in the weeds and grass made him run directly to the weeds to begin searching, missing the ball which layed in the grass in plain sight waiting to be found. To further confirm the game time home run snag of Andrew Mccutchen’s 21st homer of the season and career homer 49 I called the Pirates ticket office and asked to speak to someone who may know if the ball was snagged inside the stadium, the response I got was that no one had gotten the ball, and that it had left the stadium. The Pirates have a program where if you snag a game time home run from a Pirate they will confirm it and have it signed by the player, and then send it back to you in the mail. By video, confirmation by Pirate staff and Jim Saylors confirmation that he had ran straight for the weeds and grass I was finally sure that this rubbed up ball was the Andrew Mccutchen home run. 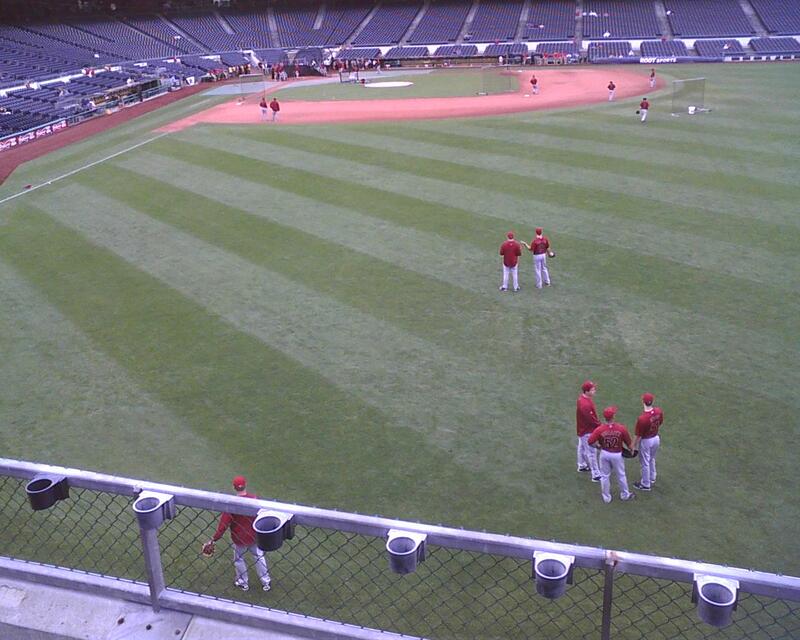 And during bp, not one ballhawk saw a bp homer leave PNC park. Gem of the Diamond, 7th career game time home run from the rising star Andrew Mccutchen. Major, Major assist by Erik Jabs, we always help each other out when possible but this was truly a great assist, thanks Erik. 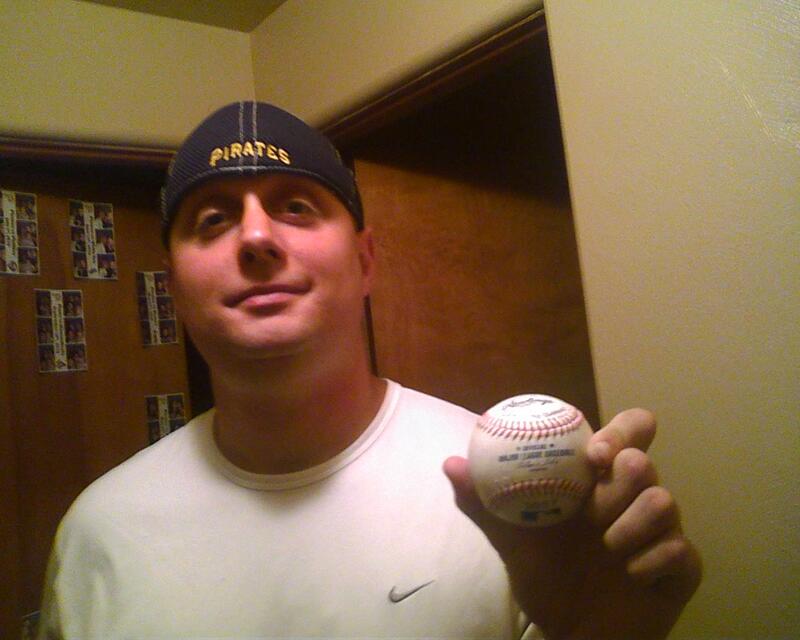 Here is a pic of the Gem of the Diamond and ball #300 of the year tossed by Joel Hanrahan. 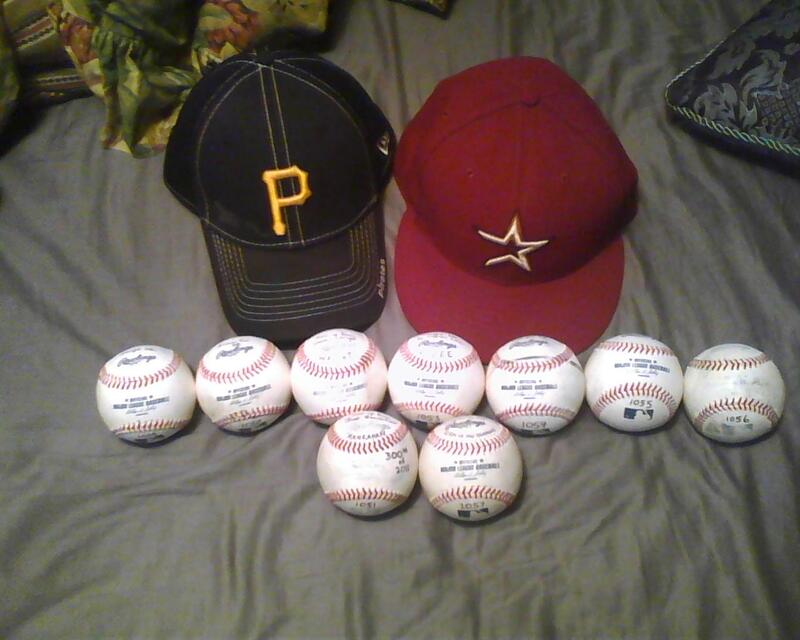 Here is a pic of todays baseballs. What a lucky break, Nick! Cool stuff, man.